It is my pleasure to be amidst you this afternoon and I welcome you to the historic Darbar Hall in Rashtrapati Bhavan. The Scout and Guide fundamental principle of ‘doing one’s duty to God and Country, and service to fellow being”, has also been the fundamental ethos that drove the act and duties of so many historical figures, who took the oath of doing so in this historic building. 2. 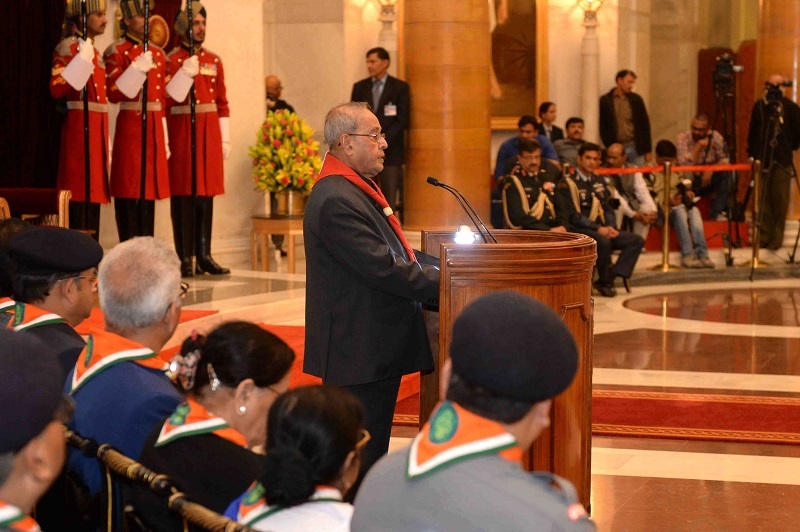 I am informed that the tradition of Rashtrapati Award Certificate has continued since 1961; since my illustrious predecessor and first President of India Dr Rajendra Prasad associated himself with the Bharat Scouts & Guides Association. It was here a couple of days back that we paid tributes to the portrait of the this great son of India on his birth anniversary. 3. Over the years, this award has inspired many Scouts and Guides to work towards nation building and it is indeed heartening that starting at a tender age, they grow to become individuals working for national integration as well as international harmony. 4. The movement of Scout and Guides is a unique platform available for the youth to learn through experience, the values of friendship, hard work, harmony and humanity. The founder of this movement Lord Baden Powell, started the movement in our country in 1909. 5. I am glad to know that Bharat Scouts and Guides with a membership of about 5.7 million is one of the largest non-governmental, non political, voluntary and educational youth organisations in our land. This is a mammoth resource pool that can undertake massive transformation if it so decides. 6. I am told that Members of Bharat Scouts & Guides have actively responded to the appeal of the Prime Minister for actively participating in the Swachh Bharat Abhiyan and that your volunteers are enthusiastically implementing it throughout the country. Dear Friends, the Swachh Bharat Abhiyan also celebrates dignity of labour, a value that was so dear to our father of nation Mahatama Gandhi. 7. Young friends, I exhort you to become messengers of values that seek to create a just and compassionate social order. Each one of us must be mindful of the sensitivities of those around us, and the effect of our words and actions on them. We must collectively preserve the core values of pluralism, compassionate coexistence and secularism that have served, over the years, to safeguard the fabric of our society. "The Bharat Scouts and Guides” must infuse a greater sense of tolerance in young minds, whilst allowing them to summarily reject any divisive agenda. 8. I am also happy to note that the Bharat Scouts and Guides is continuing to enjoy a prominent place in international Scouting and Guiding. Scouts and Guides and adult leaders are participating in various international events and have brought name and fame to the organisation and the country as a whole. 9. It is with a sense of great satisfaction that I note the wide spectrum of activities, that the Bharat Scouts and Guides have been engaged in over the past years. The efforts and the events have encompassed humanitarian aid during natural calamities, social campaigns to combat disease and debilitative habits, community workshops for skill-development, joint activities related to Millennium Development Goals and participation in international meets. I congratulate each and every member of the organization for the selfless services rendered not only to bring succor to the deprived and the needy, but also enhance the reputation of our country in the eyes of the international community. 10. I am informed that the initiatives of World Association of Girl Guides and Girl Scouts (WAGGGS) such as ‘Free Being Me’, ‘Stop the Violence’, Surf Smart and initiatives of World Organization of the Scout Movement (WOSM) such as ‘Messenger of Peace’ are being implemented very effectively. A meritorious contribution to the Messenger of Peace initiative by the Scouts & Guides which is the matter of great pride for us as Bharat Scouts & Guides is one of the first three in all National Scout Organization (NSOs) at the World level. 11 Dear young friends, in the end, I would like to take the opportunity to underscore the words of the vision statement of the Bharat Scouts and Guides, and I quote. "By 2024, The Bharat Scouts and Guides will be a globally-visible, consistently-growing and self-reliant premium youth movement that is gender-balanced, vibrant and responsive to trends”. With These words, I once again, congratulate the award winners young Scouts & Guides, Rovers & Rangers including the Adult Leaders of the movement. May your meritorious service be the lodestar for others to follow suit in the coming years. I hope that the young Awardees will continue to remain and associate themselves with the movement in some capacity or the other. They will also always "Be Prepared” to help the society especially during natural calamities and also that they will demonstrate the Scout/Guide values in their dealings with other fellow citizens. I wish all young awardees a bright future career.